Matrimonial website business is one of the most profitable online businesses for the last decade. Our readymade matrimony script is the perfect solution for the companies or individuals to start matrimony website business and earn high revenue from the script. Our Multi Religion Responsive Matrimonial Script is for all types of community peoples like Hindu, Muslim, Christian matrimonial or specific caste religion. Through our matrimonial website, the groom or bride can search suitable life partner for their romantic life. The visitor needs to login with the valid username and password, to enter into the matrimonial script. In the homepage, the user can search the matches by different search option such as age, religion, caste, and country, and matrimonial status. After the advanced search, they can find preferred matches. By clicking the specific groom or bride the visitor can see the full details of the matches. The user needs to upgrade the membership plans to get the chat option and contact information. The user can send the request to the matches, and communicate using chat. The user can pay their payments via online banking, and also offline payment. The most important features of our Responsive Matrimonial Script are quick search option, membership plan, success story, chat option; secure payment gateway, CMS management, powerful admin dashboard, user management, location management, newsletter, attractive user interface, social media links, secure communication, and many more. In the admin dashboard, the admin can view the website statistics such as member statistics, and membership user statistics. The main advantage of our matrimonial script is mobile Responsive and SEO optimized. This Script will be compatible in all type of devices like laptops, mobiles, tablets, and desktops. 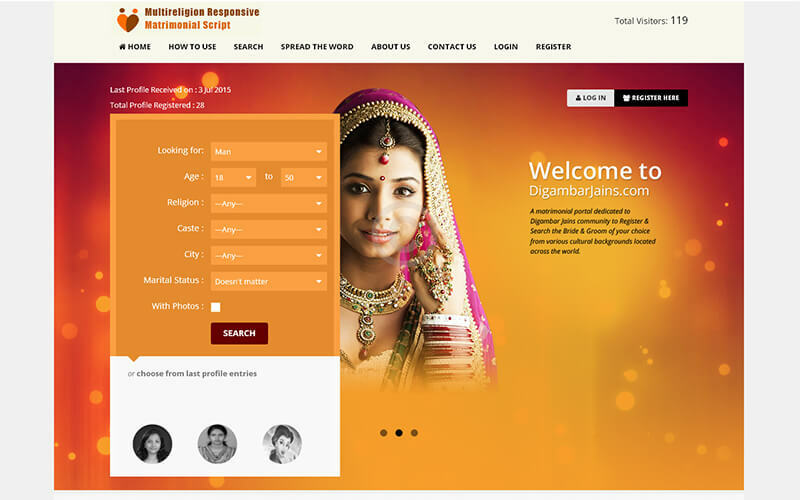 The revenue model of the Open Source Responsive Matrimonial Script for the website owner is membership plans, Google Ad sense, and Banner advertisement. The matrimonial Script is developed in PHP and MySQL with 100% open source code. The code of the script is developed with latest technologies and very secure model, so it’s very secure from hackers. Without any technical skills the admin can handle and manage the matrimonial website and the client can redesign and rebrand based on their requirements and business strategy. We provide extra benefits for this php matrimonial script such as 1-year technical support, 6 month free updates of the source code and brand free website. After purchasing the script, the site will be live within 24 hours and we are the right place to deliver the best matrimonial script to the clients. These guys from the support were just great. They helped me out in brilliant way with a small bug I have encountered. Beside that the script is huge and full future. Thank you so much for our fabulous script. I’m totally impressed that you understood how we work and helped us to put that message across to our future clients. This is my favorite responsive matrimonial script everything from customization, features, customer service and the beautifully designed script is just perfect! !